COLUMBUS, Ohio — Consumers increasingly want fresh, natural foods with wholesome, recognizable ingredients, no artificial preservatives and minimal processing. Such foods offer a “clean label,” which Food Business News identified in 2015 as Trend of the Year and in late 2016 estimated as a $62 billion market in the U.S. alone. A novel technology, known as high-pressure processing, can help provide just that. That’s just one reason why it is gaining attention throughout the food industry, said V.M. “Bala” Balasubramaniam, professor of food engineering with The Ohio State University’s College of Food, Agricultural, and Environmental Sciences. His laboratory, with a multidisciplinary team of microbiologists, chemists and nutritionists, investigates innovative food processing technologies to allow industry to implement them. Balasubramaniam is the primary author of “Kinder, Gentler Food Processing,” the cover story in December’s issue of Food Technology, the professional magazine of the Institute of Food Technologists. Known internationally for his pioneering research on high-pressure and other types of nonthermal processing, or safely processing food without heat, Balasubramaniam holds joint appointments in the departments of Food Science and Technology and Food, Agricultural and Biological Engineering. The amount of pressure currently used is significant: 87,000 pounds per square inch, give or take, compared with normal air pressure at sea level of about 14.4 psi. The packaged food experiences the equivalent of the water pressure at about 35 miles below sea level. Though the packaged food is exposed to very high pressure, it is applied uniformly across the entire surface, so contrary to popular expectations, Balasubramaniam said, the food’s structure is preserved after the process. While the pressure is high enough to destroy bacteria such as Salmonella and E. coli, it allows the prepackaged foods to retain important nutrients and other fresh-like qualities that can be destroyed by the heat used in traditional canning and pasteurization, he said. Consumers are already purchasing high-pressure processed foods perhaps without even realizing it, Balasubramaniam said. 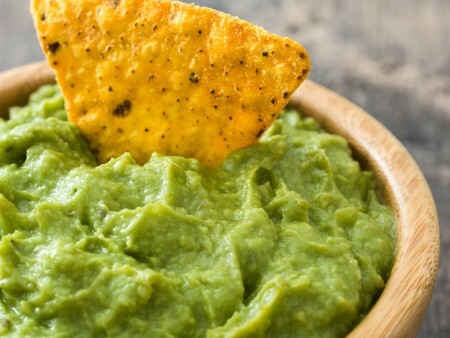 Currently, the products can be found in delis and the refrigerated section and include sauces, fruit juices, smoothies, nut milks, lunch meats, seafood, salsa, vegetable products, deli salads — and guacamole. Beverages are often labeled as “cold pressed,” Pitzer said, although terms such as “cold pressured” and “cold pasteurized” are also used. “But to be honest, consumers don’t really care about the process,” Pitzer said. What they care about, she said, are foods without additives and preservatives but that are safe and sound to consume. Even so, Balasubramaniam and his colleagues at Ohio State hope to go one better: By combining high-pressure processing with various amounts of heat or electricity, they can destroy harder-to-kill pathogens such as the spores that cause botulism. “For really harmful spores like Clostridium botulinum, you need much more hammer power — highly intensive pressure and increased temperature to kill them,” he said. Balasubramaniam’s work is identifying the right combinations of pressure and temperature to allow fresh foods to remain shelf-stable. And he’s also making other discoveries by developing high pressure-based clean label technologies for food and beverage products. For example, in work with beverage processors, Balasubramaniam found that a dairy-based product processed with a continuous high-pressure process tasted much sweeter than the traditionally processed product. “What that means is that we can reduce some of the sugar in the product and still have the same sweet taste,” he said. Other products react similarly, enabling manufacturers to reduce fat and salt in their products, as well, he said. Yogurt that is processed with high pressure becomes much creamier than traditionally pasteurized yogurt. It’s not clear how high-pressure processing causes these effects, he said. “When you work with a new technology, you first make observations, then it takes awhile to fully understand why things are happening,” Balasubramaniam said. His Food Safety Engineering Laboratory is continuing its research in collaboration with food processors and equipment vendors to develop continuous high-pressure processes for various beverage products. Pitzer said the high-pressure processing industry is forming a consortium that will focus on consumer education about the process and will develop a label so consumers can identify high-pressure products that adhere to industry standards. The Food Technology story was co-authored by Ahmed Yousef, professor of food microbiology at Ohio State; Jason Wan, professor of food science and nutrition at the Illinois Institute of Technology; and Ash Husain, chief technical officer of CedarLane Natural Foods.